The disparity between rich and poor countries is the most serious, intractable problem facing the world today. The chronic poverty of many nations affects more than the citizens and economies of those nations; it threatens global stability as the pressures of immigration become unsustainable and rogue nations seek power and influence through extreme political and terrorist acts. To address this tenacious poverty, a vast array of international institutions has pumped billions of dollars into these nations in recent decades, yet despite this infusion of capital and attention, roughly five billion of the world's six billion people continue to live in poor countries. What isn't working? And how can we fix it? The Power of Productivity provides powerful and controversial answers to these questions. William W. Lewis, the director emeritus of the McKinsey Global Institute, here draws on extensive microeconomic studies of thirteen nations over twelve years—conducted by the Institute itself—to counter virtually all prevailing wisdom about how best to ameliorate economic disparity. Lewis's research, which included studying everything from state-of-the-art auto makers to black-market street vendors and mom-and-pop stores, conclusively demonstrates that, contrary to popular belief, providing more capital to poor nations is not the best way to help them. Nor is improving levels of education, exchange-rate flexibility, or government solvency enough. Rather, the key to improving economic conditions in poor countries, argues Lewis, is increasing productivity through intense, fair competition and protecting consumer rights. As The Power of Productivity explains, this sweeping solution affects the economies of poor nations at all levels—from the viability of major industries to how the average consumer thinks about his or her purchases. Policies must be enacted in developing nations that reflect a consumer rather than a producer mindset and an attendant sense of consumer rights. Only one force, Lewis claims, can stand up to producer special privileges—consumer interests. 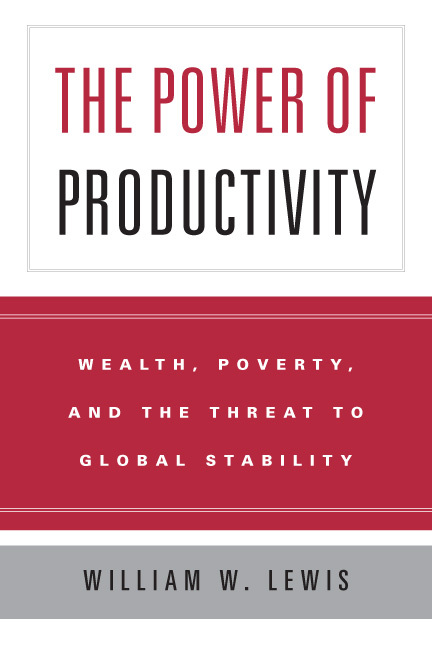 The Institute's unprecedented research method and Lewis's years of experience with economic policy combine to make The Power of Productivity the most authoritative and compelling view of the global economy today, one that will inform political and economic debate throughout the world for years to come. William W. Lewis was a partner at McKinsey & Company for twenty years and the Founding Director of the McKinsey Global Institute. He held several policymaking positions in the U.S. Departments of Defense and Energy and also served in the World Bank for four years earlier in his career. His work has appeared in the Wall Street Journal, the New York Times, and the Economist. Book published by University of Chicago Press, 2004. Page maintained by BiblioVault.